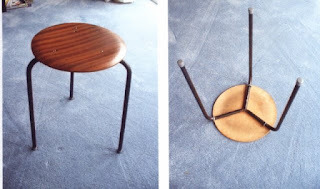 Every day I discover that I am not alone in my enthusiasm for Mid 20th century design. Yesterday while visiting degree shows at BIAD at City University Birmingham I picked up a leafted about MODA Museum of Domestic Design and Architecture. http://www.moda.mdx.ac.uk/ Today it came up in a conversation with Eleanor John at http://www.geffrye-museum.org.uk/(one of my favourite places to be.) Diamond Geezer's blog http://diamondgeezer.blogspot.com/2008_03_01_archive.html has a great post on it and from reading some more of his posts I realise that I'm not alone in my appreciation for yesteryear; Lady bird books, Magic Roundabout (the original) and Fanny Craddock to name but a few topics to explore in the future. In the meantime here's one of my favorite images. 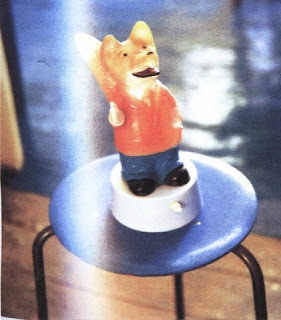 A perfect Plywood Danish Design stool and a light up Basil Brush . Say no more!